300th Anniversary of Russian Navy - A 1996 commemorative site that includes a chronology of important naval events, images of flags, biographical information on past admirals, images and written descriptions of modern and past ships, and an illustrated history of the Russian Navy to 1917. American Neptune, The - A quarterly journal of maritime history and arts. Columbus Navigation Homepage - Examines the history, navigation, and landfall of Christopher Columbus. Corporation of Trinity House - Trinity House is a unique maritime organisation which throughout its long and distinguished history has had as its prime objective the safety of shipping and the welfare of seafarers. Constituted under a Royal Charter granted by Henry VIII in 1514, today the Corporation has three functions: The General Lighthouse Authority for England, Wales, The Channel Islands and Gibraltar, providing aids to general navigation such as lighthouses, lighthvessels, buoys and radio navigation systems. Dictionary of American Naval Fighting Ships (DANFS) - The foremost reference regarding U.S. naval vessels. Published in nine volumes (from 1959 to 1991), it gives histories for virtually every U.S. naval vessel. Fleets List - There were a great many companies involved in the ocean trade. The fleet list is an attempt to collect the names of the companies, a brief history of each and the names of the vessels they used. George Raper Collection at the National Library of Australia - Items in this collection provide wonderful insights into the life and work required of eighteenth-century midshipmen in the British Navy. Apart from their intrinsic value as an original record of hydrographic survey during the voyage of the First Fleet, the collection as a whole demonstrates the practical skills required by naval officers to master the theory of navigation. The collection brings together excellent examples of three types of documents of vital importance for sailors - coastal profiles, maps and navigation calculations. Henry Hudson - Wikipedia backgrounder to the life and voyages of English explorer, mariner and adventurer, Henry Hudson, as well as some additional resources. How Do I Find My Hull Number? - The hull number is part of the Hull Identification Number (HIN) which is molded into the transom. The HIN is located on the outside of the stern in the upper starboard corner. In many states the HIN is on your title. Hunt for the Alligator: The U.S. Navy's First Submarine? - The National Oceanic and Atmospheric Administration (NOAA), with support from the U.S. Navy's Office of Naval Research, is on the hunt for the Alligator - the U.S. Navy's first submarine. It's out there somewhere, just off the North Carolina coast in the 'Graveyard of the Atlantic,' just waiting to be found. A green, 47-foot-long creature of the deep called the Alligator - an engineering marvel of the Civil War that helped usher in a new era in naval warfare. A secret weapon that captured the attention of a president and can claim a proud place in history as the U.S. Navy's first submarine. Institute of Marine Engineering, Science and Technology (IMarEST) - One of the most comprehensive information centres in the world for marine professionals. It is the leading source of information on marine engineering, science and technology with more than 8,000 books, 1,000 conference volumes and over 100 subscribed professional journals. Users have access to reference holdings, members loan facilities and direct purchase of information. MIC staff maintain a high level of service and assist users with literature searches, research and technical enquiries. International Marine Signal Flags - International signals used by ships at sea. John Harrison - A self-educated English carpenter and clockmaker who invented the marine chronometer, a long-sought-after device for solving the problem of calculating longitude while at sea. Journal for Maritime Research - Publication of the National Maritime Museum, Greenwich, London. Lost at Sea: The Search for Longitude - The companion Web site to Lost at Sea: The Search for Longitude, a NOVA PBS program. Based on the bestselling book Longitude by Dava Sobel, the program tells the story of how an unknown genius, John Harrison, discovered the key to navigating on the open seas and thus solved one of the thorniest problems of the 1700s. Mariners' Museum (Newport News, Virginia) - International in scope, the collection is composed of more than 35,000 maritime items including ship models, scrimshaw, maritime paintings, decorative arts, intricately carved figureheads, working steam engines, and more. The Museum's Research Library and Archives house some 75,000 volumes, 350,000 photographs and negatives, and one million archival items, including the archives of Chris-Craft Industries. Maritime History Virtual Archives - Lars Bruzelius' site. Maritime Matters - Ocean liner history, cruise ships, steamships, historic vessels, with links to ship cams and maritime museums. Content includes current cruise ship news, U.S. steamship company history, news and photographs of passenger vessels, preserved and vintage ocean liners, personal recollections of ocean liner travel and links to maritime businesses. Maritime Museum of the Atlantic - The marine history division of the Nova Scotia Museum. Maritime Museums - Master index to worldwide maritime museum Internet resources. Military and Maritime Museums - Drs. Martin H. Evans' and Janet West's directory of links to lists of Naval and Maritime Museums in Britain, Ireland and their islands. Mysteries of the Deep - Scientists unlock secrets from the last frontier on Earth - the ocemas depth. A Scientific Amercian PBS offering. Mystic Seaport: The Museum of America and the Sea - Founded in 1929, the Museum is home to four National Historic Landmark vessels, including the Charles W. Morgan, the last wooden whaleship in the world. Mystic Seaport also features a re-created 19th-century coastal village, a working preservation shipyard, exhibits and a planetarium. The Museum's collection of more than two million artifacts includes more than 500 historic vessels and one of the largest collections of maritime photography in the country. Research the collections. National Maritime Historical Society (NMHS) - NMHS communicates with its members through its quarterly publication Sea History Magazine, recognized as the pre-eminent journal of advocacy and education in the field. 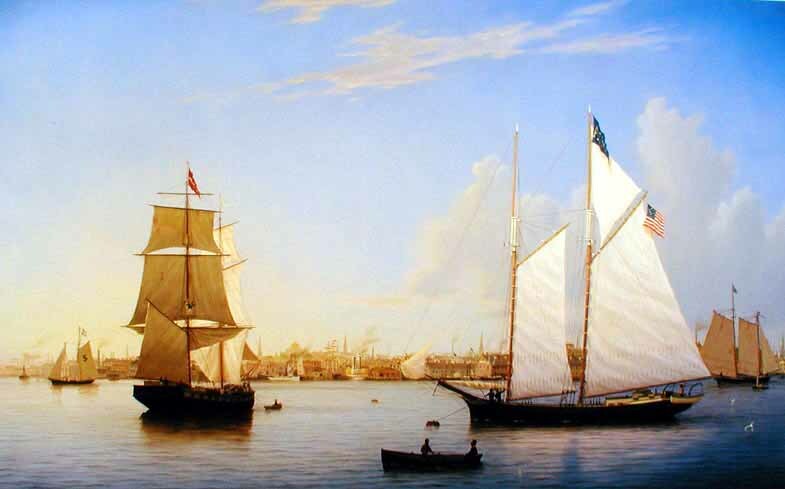 Sea History covers the world of maritime museums, sail training, shipping history, and the art, literature, adventure, lore and learning of the sea. National Maritime Museum (Greenwich, London): Research Guides - The Museum's gateway to maritime information on the Internet covers Internet resources, research guides, international events and much more. National Maritime Museum Association - Dedicated to maritime preservation and education. The park unit, located at the West end of Fisherman's Wharf along San Francisco Bay, has one of the largest collections of historic maritime ships in the world. Naval History Magazine - A a publication of the U.S. Naval Institute. Official Site of the Hunley - The excavation and renovation of the Confederate submarine H.L. HENLEY in South Carolina. Royal Museums Greenwich - Comprises the Royal Observatory, Cutty Sark, National Maritime Museum and Queen’s House. Dedicated to enriching people’s understanding of the sea, the exploration of space, and Britain's role in world history. San Francisco Maritime National Historical Park - Located at the west end of San Francisco's Fisherman's Wharf. Includes a fleet of historic vessels at Hyde Street Pier, the Maritime Museum, and the Maritime Museum Library. Santa Barbara Maritime Museum - Maritime history of California's Central Coast. Schooner Man: Tall Ships - Information on schooners, brigs, brigantines, bark, and fully rigged tall ships. Scribbling Mariners - Articles and tall tales on a life at sea. Seaport Museum New York - The mission of the Seaport Museum is to trace the history of the Port of New York, and its commercial and cultural impact on the city, the state, and the nation. The museum fulfills its mission through its galleries and exhibits, living history programs, programs and events, educational programs for children and adults, and the largest privately owned collection of historic vessels (in tonnage) in the U.S. Ships in Books Index - Index to ships mentioned in non-fiction books on ships and maritime history. Ships List, The - Helps you find your ancestors on ships' passenger lists. Also provides immigration reports, newspaper records, shipwreck information, ship pictures, ship descriptions, shipping-line fleet lists and more; as well as hundreds of passenger lists to Canada, USA, Australia and South Africa. Steamboats - Dedicated to paddlewheel riverboats. TheShipsList - Helps those seeking the details of their ancestors' ships; passenger records; contemporary immigration reports; newspaper records; ship wreck information; ship pictures. TRANS-CAMS - A collection of maritime and other webcams including major ports of the world, canals, shipyards and even ships at sea. U.S. Naval Institute - One of the world's foremost sources of knowledge of naval and military affairs. U.S. Naval Institute Proceedings - A publication of the U.S. Naval Institute comprised of articles written by sea-service professionals and key naval officers that directly affect the naval and maritime world. University of Newfoundland: Maritime History Archive - Collects and preserves original documents and copies of documents relating to the history of sea-based activities in the North Atlantic region. Vintage Ships - Vintage passenger ship roundup: cruise vessels, passenger liners, missionary, or training ships. Waterfront Museum and Showboat Barge - Provides waterfront access, promotes historic preservation, fosters an understanding of the NY Harbor as a waterway carrying commerce and commuters as well as a means for culture and recreation. Pier 44 off Conover Street in Red Hook (Brooklyn, New York). This webpage last updated on Monday, August 21, 2017 8:50 AM.